This airticle's factual accuracy is disputit. Please help tae ensure that disputit statements are reliably soorced. See the relevant discussion on the collogue page. Nae tae be confused wi Scots Inglis or Scots leid. 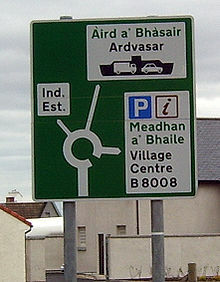 A roadsign in baith Gaelic an Inglis. The Scots Gaelic leid (Gàidhlig) is a Goidelic, Celtic leid an ane o the aulder leids o Scotland. It is a Q-Celtic leid that's spak in the northren pairt o Scotland (the Hielands an Islands), an abreed in Canadae (Cape Breton Island, Nova Scotia). It is sib tae the Erse an the Manx Gaelic, an tae the Welsh, Cornish an Breton forby. Gallowa & Ayrshire – Robert the Bruce an Walter Kennedy baith spak Scots Gaelic. Glesca – "Auchenshuggle", "Govan", "Drumchapel" etc. aw cam fae Scots Gaelic an aw. Glesca still haes a michty community the day o Gaels that speaks the Gaelic, an is hame tae the first Gaelic medium Secondary School. There wis a kinrick in Ulster haurd forenenst the coast richt alang by the Giant's Causey cried Dalriada wi a wheen o warriors cried the Scots. The first translate o the Bible intae Scots Gaelic wisna makkit til 1767 whan Dr James Stuart o Killin an Dugald Buchanan o Rannoch shapit a translate o the New Testament. Gey few European leids hae makkit the transition tae a modren leeterar leid athoot an early modren translate o the Bible. Gaelic no haein sic a translate til the late aichteent century nae doubt contributed tae the decline o Scots Gaelic. The day, it is spoken anerly by aboot 60,000 fowk in Scotland an aiblins 1,000–2,000 in Nova Scotia, Canadae. Anerly the Wastren Isles o Scotland hae mair fowk that can speak the leid nor no (61% o the fowk speak Gaelic). The place in Scotland wi the muckle maist percentage o Scots Gaelic speakers is a clachan cried Barvas on the Isle o Lewis. Here, 74.7% o the fowk speak the langage. Mony fowk are stairtin tae lear the leid. Scots Gaelic is gey close tae Erse an Manx, the ither Goidelic leids an thur written forms are sometimes e'en mutually inteligible tae ilka ither. The Pechts wis in whit is nou Scotland lang afore the Scots or Scotland, an acause o this Scots Gaelic haes some o thair tongue in it. Wirds the likes o "Ben" (Head/Peak) an "Aber" (Gub o a muckle river) gies us a keek at whit the aulder leid o Scotland. Ben an Aber is niver foond in the Erse but are in the Welsh, Cornish an Breton forby. Wikimedia Commons haes media relatit tae Scottish Gaelic language. This page wis last eeditit on 19 Apryle 2019, at 14:01.